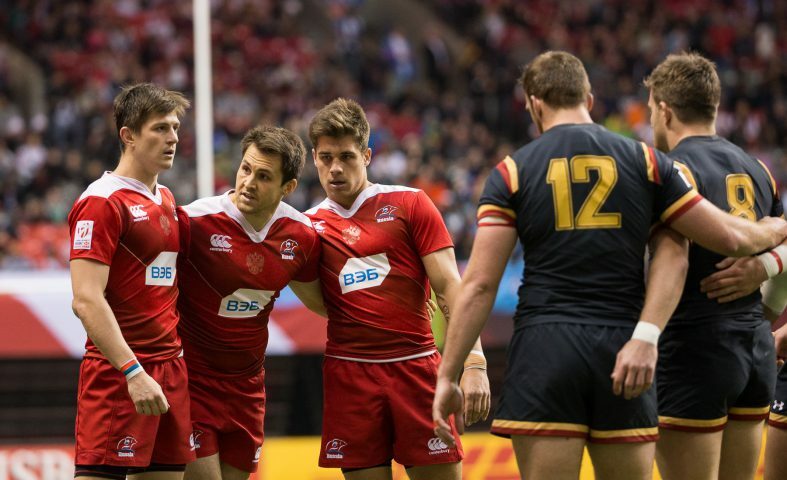 The 2018 Series will include ten tournaments held around the world, in which 16 national sevens teams compete for World Series points at each round. 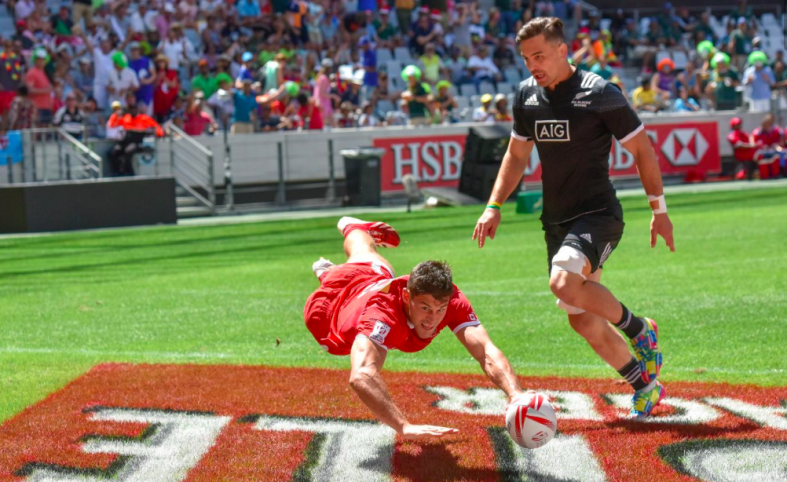 The HSBC World Rugby Sevens Series is culminated with a champion being crowned at the end of the season based. Each Series stop has the 16 teams divided into 4 even pools based on previous rankings. Day 1 of each tournament consists of round-robin play between pools. Day 2 will see the bottom two teams of each pool will contest in the Challenge Trophy competition, where the higher seeded teams will progress to the Cup competition and have the chance to win gold, silver, or bronze medals. The electricity of rugby sevens debuted at the Rio 2016 Olympics and kept the world on the edge of their seats, delivering a roller coaster of a tournament including big plays, unsung heroes, and overwhelming excitement. It concluded with an emphatic victory by the ‘Flying Fijians’, who brought their country its first ever gold medal. There are 15 ‘core’ teams who participate at each round of the Series. The 2016-17 core includes: Argentina, Australia, Canada, England, Fiji, France, Japan, Kenya, New Zealand, Russia, Samoa, Scotland, South Africa, USA, and Wales. For more on promotion/relegation, please visit World Rugby for Series Qualifying information. British Columbia is home to more than 200 bands and 34 distinct First Nation languages and associated cultural identities. As a result, First Nations peoples in B.C. are the most culturally and linguistically diverse in Canada, with each First Nation having a unique history and experience. 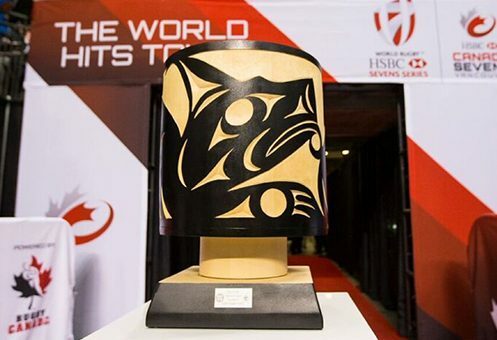 The HSBC Canada Sevens takes place on the traditional territory of the Coast Salish tribes – specifically the Musqueam, Squamish and Tsleil-Waututh First Nations. The tournament is proud to partner and engage with these communities. One of the ways the culture of the First Nations is honoured each year is with the production of trophies and medals by local Indigenous artists. The awards pay tribute to the sport of rugby through compelling symbols of native art related to the sea, land, mountain and sky. The Tournament Cup is the one trophy that remains in the host city of Vancouver, to be won by a new team each year. It features the design of a wolf, known to be a great team player that symbolizes perseverance and success. As a valued partner of the tournament, Wheaton Precious Metals has been a key contributor to the creation of the tournament trophies.